Evaluating the medical journal landscape is the first step toward making sure manuscripts find their way to the appropriate home. In fact, the journal selection process contains many similarities to a real estate search. The old real estate adage of location, location, location also holds true with journal selection. Knowing where to look is an essential first step to the journal selection process. To ensure that a manuscript is read by the target audience it must be submitted to the correct forum. Continuing with the real estate analogy, think of therapeutic areas like neighborhoods. Some neighborhoods, like neurology and cardiology, are bigger than others and therefore contain more streets and houses. Streets represent the clinical specialty areas and indications, while houses are the individual journals. Two of the streets in the cardiology neighborhood are Hypertension Road and Thrombosis Way. The American Journal of Hypertension and Journal of Clinical Hypertension are houses located on Hypertension Road. Pharmaceutical medical publications teams need to draw (and regularly update) their medical journal road map before determining how and where to publish. To do this the medical publications manager should be aware of the journal landscape in all of the neighborhoods important to his or her company’s therapeutic areas. That means learning all the potential streets where the company’s manuscripts might call home. Settling on one street for a particular manuscript is not always a cut-and-dry decision. The final decision boils down to the target audience. Is the manuscript attempting to address the educational needs of primary care physicians or specialists? Findings from a late-stage clinical trial might very well appeal equally to the entire medical community, a full therapeutic area or several clinical specialties. Choosing the correct neighborhood, and then street, in those cases can be a challenge. On the other hand the real estate search for a manuscript containing findings from a Phase I pharmacokinetic study for endocrinology might be more limited. There might be only one street of interest — PK Lane. With task number one complete — drawing the company’s roadmap for medical journals — it’s time to go house hunting! The medical publications team can focus on selecting the appropriate medical journal(s) for manuscript submission. As with all major decisions in life, it’s a good idea to have contingency options. At first glance, all of the houses on Cardiology Court look fairly similar. They all have heart-shaped windows and are painted red. Actually, one of the houses is blue, but that will probably change once it gets some air. (Is this microphone on?) But we’ve learned what happens if you judge a book by its cover, the address on the mailbox or the name on the cover of the medical journal can only tell you so much. To really find the perfect forum for a particular manuscript, you need to actually go into the house and poke around a bit. Get a feel for the place. In CEI’s most recent study on medical publications, we asked pharmaceutical companies to rank the most important journal selection criteria on a scale of 1 to 5 (5 = very important selection criteria). Here are the results. Peer review tops the list. However, most standard houses come equipped with peer review these days, so I won’t spend any more time on why peer review is important to journal selection. The next evaluation criterion on the list is impact factor, earning an average rating of 4.0. The impact factor of a journal is the average number of citations received per paper published in that journal during the two preceding years. Impact factor, as a journal evaluation criterion, is most similar the square footage of a home — everyone looks for it and bigger is indeed better. While size of a home is very important, it should by no means be the only consideration. A 10,000-square-foot mansion might not be all that appealing if it only has half a bathroom and noisy neighbors. Same goes for impact factor. It is a great way to compare medical journals against one another, but it’s not the only way. 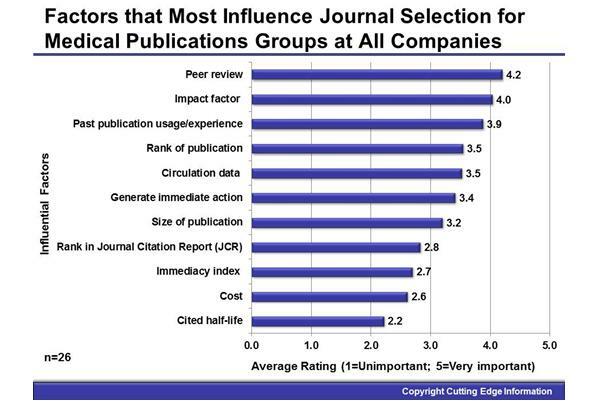 I would argue that a journal’s circulation data is just as important as its impact-factor (although survey respondents rated this criterion a 3.5). If a manuscript is published in a high-impact journal, but it is not read by the intended audience (PCP’s instead of specialists, let’s say) — what kind of impact did it really make? That’s why a solid understanding of the circulation data is critical to achieving key publications goals. At the very least you need to know the types of medical professionals that read the journal and how many. Those basic pieces of information can help give a more complete picture of the potential impact your manuscript will enjoy. Third on the list is past experience with a journal, earning a rating of 3.9. This is very important to the house hunt. Maybe you’ve visited the house before with another manuscript. If that experience went well, you might visit the same house again. Hopefully you have been able to form some kind of relationship with the journal’s staff. If that first visit went poorly (i.e. your manuscript endured a nine month review before it was eventually rejected), then the impact factor of the journal doesn’t mean much — you will likely never submit a manuscript to that journal again. Of course, there are more considerations than the factors listed in the graphic above. For instance, does the house have any of the important upgrades, like stainless steel appliances or vaulted ceilings? In the world of medical journals, those important upgrades could be an expedited peer review option or a web-before-print publication option. The faster the pharmaceutical company can get a physician to read a manuscript the better, regardless of the medium. Both of these particular upgrades enhance publication speed, and you might pay a little more for a house boasting those upgrades. But if speed to publication is important to your company’s strategy, than these details are important to your house hunt. Now, you should be a) ready to start the journal selection process, b) ready to start looking for a home, or c) thoroughly confused. I hope that the real estate metaphor has you excited to evaluate the medical journal landscape for your company. Ryan McGuire is a proud graduate of Rutgers University with a degree in Finance. Born and raised in New Jersey, Ryan moved to North Carolina in 2008 to start a new career with the pharmaceutical research benchmarking firm Cutting Edge Information. Since joining CEI Ryan has led research projects in topic areas such as: market access, clinical operations, medical affairs, patient recruitment, lifecycle management, investigator initiated trials (IITs), medical publications and medical information. Ryan earned the award for research report of the year at CEI in both 2010 and 2011 – recognizing his role as project leader for the highest selling report in that calendar year. In 2011, it was his work on the medical affairs benchmarking report Medical Affairs: Effective Global Resource Allocation that earned him the title of report of the year. 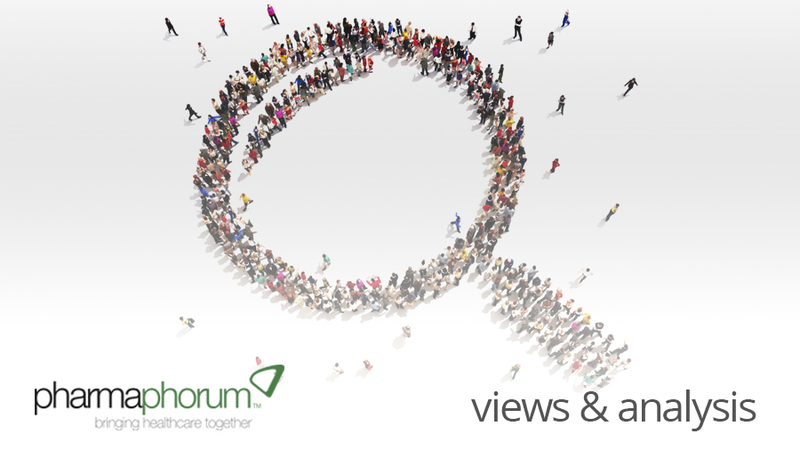 What factors influence you when evaluating the medical journal landscape?